Deep and machine learning is becoming essential for a lot of businesses, be it for internal projects or external ones. The data-driven approach allows companies to build analytics tools based on their data, without constructing complicated deterministic algorithms. Deep learning allows them to use more raw data than a machine learning approach, making it applicable to a larger number of use cases. Also, by using pre-trained neural networks, companies can start using state of the art applications like image captioning, segmentation and text analysis—without significant investment into data science team. But one of the main issues companies face with deep/machine learning is finding the right way to deploy these models. I wholeheartedly recommend a serverless approach. Why? Because serverless provides a cheap, scalable and reliable architecture for deep learning models. In this post, we’ll cover how to build your first deep learning API using the Serverless Framework, TensorFlow, AWS Lambda and API Gateway. Using serverless for deep learning - standard ways of deploying deep learning applications, and how a serverless approach can be beneficial. “Hello world” code - a basic Lambda function with only 4 lines of code. There is no API here, we’ll start with the simplest possible example. Code decomposition - looking through the configuration file, and the python code for handling the model, to understand how the whole example works. API example - get a working API for image recognition on top of our example. If you want to skip the background about what TensorFlow is and why you’d want to use serverless for machine learning, the actual example starts here. First of all, let’s briefly cover what TensorFlow is: an open source library that allows developers to easily create, train and deploy neural networks. It’s currently the most popular framework for deep learning, and is adored by both novices and experts. Currently, the way to deploy pre-trained TensorFlow model is to use a cluster of instances. First of all, a serverless serverless approach is very scalable. It can scale up to 10k concurrent requests without writing any additional logic. It’s perfect for handling random high loads, as it doesn’t take any additional time to scale. Second, you don’t have to pay for unused server time. Serverless architectures have pay-as-you-go model. Meaning, if you have 25k requests per month, you will only pay for 25k requests. And not only does it make pricing completely transparent, it’s just a lot cheaper. For the example TensorFlow model we’ll cover in this post, it costs 1$ for about 25k requests. A similar cluster would cost a lot more, and you’d only achieve pricing parity once you hit 1M requests. Third, infrastructure itself becomes a lot easier. You don’t have to handle Docker containers, logic for multiple requests, or cluster orchestration. Bottom line: you don’t have to hire someone to do devops for this, as any backend developer can easily handle it. As we’ll see in a minute, deploying a serverless deep/machine learning infrastructure can be done with as little as 4 lines of code. As mentioned above, clusters are more cost effective after a certain number of requests. In cases where you don’t have peak loads and the number of requests is really high (I mean 10M per month high), a cluster will actually save you money. Lambda has a small, but certain, startup time. TensorFlow also has to download the model from S3 to start up. For the example in this post, a cold execution will take 4.5 seconds and a warm execution will take 3 seconds. It may not be critical for some applications, but if you are focused on real-time execution then a cluster will be more responsive. Let’s get started with our serverless deep learning API! For this example, I’m using a pretty popular application of neural networks: image recognition. Our application will take an image as input, and return a description of the object in it. Note: The model and example are also available here. To get started, you’ll need to have the Serverless Framework installed. As you can see, our application successfully recognized this picture of a panda (0.89 score). That’s it. You’ve just successfully deployed to AWS Lambda with TensorFlow, using the Inception-v3 model for image recognition! If we will look into the index.py file itself, we will see that first we need to download the model (.pb file) to the AWS Lambda .tmp folder, and then load it via a standard TensorFlow import function. Now, let’s move on, and add an API to this! We’ve created a TensorFlow endpoint on AWS Lambda via the Serverless Framework. Setting everything up was extremely easy, and saved us a lot of time over the more traditional approach. 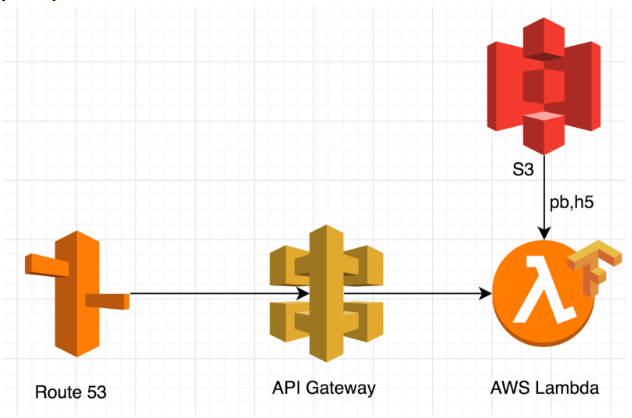 By modifying the serverless YAML file, you can connect SQS and, say, create a deep learning pipeline, or even connect it to a chatbot via AWS Lex. As a hobby, I port a lot of libraries to make the serverless friendly. You can look at them here. They all have an MIT license, so feel free to modify and use them for your project. I’m excited to see how others are using serverless to empower their development. Feel free to drop me a line in the comments, and happy developing! Cloudflare Workers integrates with the Serverless Framework. Use Cloudflare Workers to add reliability and uptime to your existing FaaS! What are Serverless Components, and how do I use them? Serverless Components gives you a way to compose and share parts of a cloud application. Serverless development just got even easier.